Resident Evil Revelations 2 Promotional Poster Leaked? Fake or Legit? The pictures made of the poster show the Resident Evil Revelations 2 logo, a release date and the Nintendo 3DS logo. It could be possible that Capcom will release Revelations 2 exclusively for Nintendo 3DS, with a port to home consoles following a year later, just like they did with the first Resident Evil Revelations game. 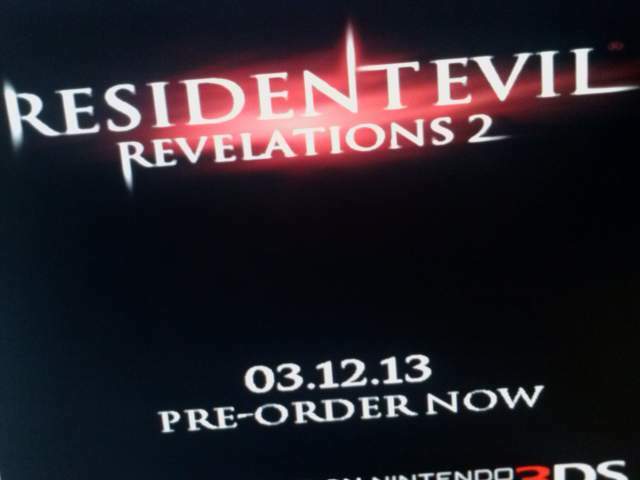 Resident Evil Revelations 2 will be released on December 3, 2013. December seems a bit soon. I'd definitely be interested on 3DS again though. I've seen more real breasts in Hollywood than this. Would be massively surprised if true; Capcom's E3 booth was incredibly bare (DR3, Ducktales, LP3, D&D, AA5 - that's it) and one would've thought they'd have had this there at least, especially with a supposed launch this year. I'd be quite happy if this was real. Revelations is spelled correctly, fake. Doubtful though personally I'd like to see where things would go after Revelations' ending. Obviously fake, it pretty clearly says 'Revelations', not 'Revelaitons'. Can't wait for this and Resident Evil 7. And Resident Evil 4 where they go to Umbrella Headquarters in Paris. I don't think I've ever seen a purported leak accompanied by off-angle photos later proved to be true. Hm, to buy it on 3DS or to wait for HD ports. And why no announcement at E3? Are they waiting for unveiling it at a Nintendo Direct? I can't see the release date being on a poster like this before the thing is even officially announced. Probably fake, but I wouldn't mind if they did another take on a Revelations-like game. For some reason I keep on imagining a RE game set in a Jungle somewhat in the vein of Revelations, but don't know why. What's with these off screen, angled logo shots? Yeah, while there's a slim possibility of a Direct I just don't believe they'd have it out for December but completely fail to bring it up at E3, even for something like TGS I'd assume more time afterwards like a spring release. I also find it hard to believe that the sequel would again be (temporarily) exclusive to the 3DS: more likely is that it'd be multiplatform from the off. Another 3DS only RE game = no buy. Why would it just be for 3DS after the HD ports just came out? Given that it would come out in 5 months and we've heard nothing up to now, it has to be fake. Otherwise it's some terrible marketing. I think it's fake, so it will be confirmed in the next two hours. 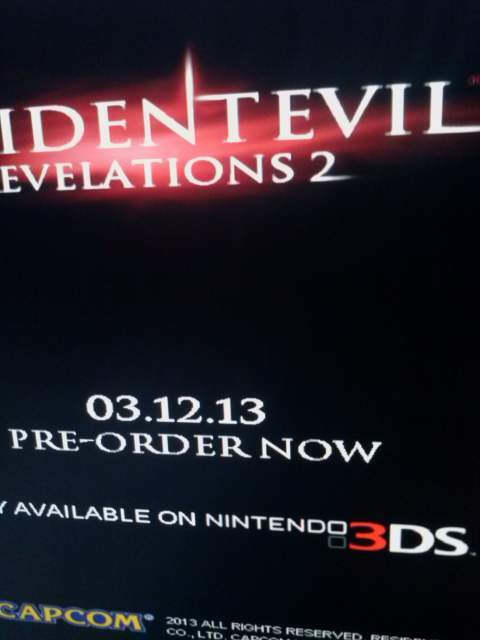 Aside from terribly smudged letters in the title, 3DS exclusivity is what seals it as a fake. these off screen logo leaks are all fake by default. The only reason I could think it would only be on 3DS after the HD versions is if Capcom made a deal with Nintendo that the Revelation titles would be something like 6 month exclusive to the console. Even this hold that much weight, as I'm sure Nintendo would prefer it on Wii U. You should probably remove that Gamepur link OP. They usually steal stuff from other sites without giving proper credit. I think the sources aren't credible but hard to say at this point, and if they do make a sequel it won't be a 3DS exclusive. I actually think a 3DS-exclusive follow up would make sense, because then they'd again have the option to develop the game to the specs of the 3DS and port it later with a somewhat weak tech but a good "excuse" for it. Gee if only there had been a major game show to show this off at, its not like Nintendo needed more to show either. Unless Nintendo is behind this, it's fake. I don't know if it sold better when it went digital and only cost $20 (it was on top seller list for a month), but the game originally sold badly, hell sold badly on consoles. is that supposed to mean dec 3rd 2013? I'm going to go with the European style and say December, as it didn't come out 3 months ago. Which also means if real its possibly prepped for Gamescom, but thats a very short window between reveal and release. we should have a fake announcement 'shop contest, spread it then over twitter and watch how fast those game blogs will consider it real. Why would someone take intentionally horrible shots of a poster? It surely isn't because taking a picture is like being in an old fashioned spy movie... This reeks of fake. It didn't sell that well on anything. Got a boost when it hit eshop for like a month, but i doubt it was significant. Capcom is correctly spelled. Fake.